Now, this Kangaroo Crossing Sign isn't something we are too familiar with in the UK but it is a common sight to our Australian friends. 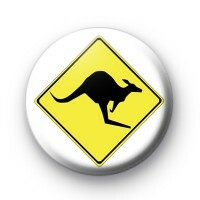 This badge is funny to give to any friends from Aus just to make them feel more at home. Or if you're organising an Australian themed party at school it would make a cool addition to the party bags.